Cyclists in the City: Conservatives: Mayor shouldn't favour people who cycle or walk because it might slow down people who drive. Conservatives: Mayor shouldn't favour people who cycle or walk because it might slow down people who drive. Finally, the Conservatives in London seem to be calling a spade a spade. Today, the London Assembly released its report, The Future of Road Congestion in London. The report makes various recommendations about London's road transport plans. In particular, it recommends that the London Plan, which is the strategic plan for London's economic, environmental, transport and social framework over the next 20-25 years, make explicit that walking and cycling are given precedence by transport planners. What the London Assembly is saying is that priority should be given to waking and cycling over private car use. That doesn't mean banning cars. It simply means that obstuctions to walking and cycling should be removed. It means that London's roads should be made fit-for-purpose for cycling and for walking and that these forms of transport should be given priority over private car use. It also means that people who cycle should be given greater protection on London's roads. If you don't do this, you end up with schemes such as Blackfriars. Blackfriars will get two more lanes for motor vehicles and an increased speed limit. This will make it harder and more dangerous to navigate both for people on cycles and on foot but make it easier and faster for people in private motor cars. In 1982, the House of Lords debated this exact issue. They asked how it would be possible to reduce motor congestion. The most telling comment in that debate was this one, by Lord Donaldson of Kingsbridge: "When it comes to too many cars and solo drivers, there is only one way to deal with that; namely, to make motoring short distances in London so disagreeable and expensive that people stop doing it." The Conservative Assembly Members don't agree. They have specifically added an appendix to the Assembly's report that flatly rejects any form of priority for people on cycles or on foot. Have a look at page 42 on this appendix "Neither the Mayor nor the Government should impose an artificial road user hierarchy as this inevitably has the effect of effect of deliberately slowing down some users. Further to this, the Mayor should encourage cycling by emphasising that it is cheap, healthy and quick, not by worsening conditions for other road users." There is already an artificial road user hierarchy. It is that the bigger and faster you are, the more you have priority on the roads. If you're on a cycle or on foot, the Conservatives appear to be suggesting you should keep out of the way of people on the roads who have faster or bigger machinery. And this, so that you don't slow down those people in private motor vehicles. Cycling, it seems, ought to be encouraged through marketing alone. The nub of Blackfriars is all contained in this one paragraph. It's nothing to do with safety or with traffic models. In complete contrast to previous indications that creating greater protection for cycling might be sensible, the Conservatives are stating they do not want to give priority to people who cycle or walk because that might mean other people (who are no more or less important than those people walking or on cycles) might have to drive slightly more slowly. And they think that some glossy messaging is all that's needed for people to switch from driving to cycling. It brings a chilling new meaning to Transport for London's policies. TfL states: "all road users have to be considered with equal weighting". If that's the case, then London's Conservatives have declared the death of London as a place where cycling will ever reach 5% share of the traffic (which, coincidentally is the Mayor's policy). Because, if you don't believe that a person on a cycle or on foot needs prioritising and protecting on London's roads, there's only one way to have 'equality' on the road: If you walk or cycle, the only way you have equal weighting to a person in a private motor vehicle will now be to become as big and as fast as them. The rules of the road simply don't allow for anything else. I think it may be time for cyclists to group together. Not for a go-slow. But to create multiple trains of bicycles all over London's roads. Each moving politely en masse in the same direction, a group of people on cycles, taking as much space as a motor vehicle, creating as much congestion and as much noise. And making it exceedingly obvious why cycling and walking need greater priority. Maybe I should buy a pedibus and use that as my means of commuting? Um, then again I'd have to take a longer route, and might have an issue parking it when I get there. Though it would get the point across if used as a protest. Remember how it was at school? Good behaviour was rewarded, bad behaviour was punished. Bikes are good for the city. Private cars are not. As the prevalent road conditions are geared towards the motorist already, ergo creating a hostile environment for pedestrians and cyclists, then of course there needs to be a hierarchy of road users and bikes and pedestrians should receive priority treatment. How do we go about making sure that the London plan goes our way? And what is Boris , who cycle's himself, have to say to this? Presume, this only happened, as the Con/Dem's are in power in London. Folk should think of the consequences when voting! How are they going to justify the fact of the congestion charge ? Last time I was in the US, (in Philadelphia) we were driving with some friends, crossing a bridge and below I saw a sea of cars. I said to my friend "now that's a massive parking lot"! (I'm fascinated at how everyting in America is BIG! ), and he said "that's not a parking lot, that's the highway!". It was a traffic jam. No car was moving. I was beyond shocked. And there was not a single bicycle in sight. And that's what we are going to end up with here if we let the Tories run the show. VOTE THEM OUT!!!! Just emailed my AM Richard Tracey to see what he has to say about it. Did bring up that the RAC Foundation support road pricing, and that one of the challenges in the Mayors Transport Strategy is about providing the most efficient transport for people and goods around London. Surely the most efficient vehicles for transporting people should be prioritised, non? I'll let you know what the response is, as, when and if. Actually, I am sure your average Tory would, on only a little reflection, conclude that the pedestrians and indeed mopst of the cyclists are individually more important than the motorists - the former are bankers, accountants, judges, lawyers, patent agents, underwriters, etc, while the latter are plumbers, electricians, travelling salesmen, IT engineers, dustmen etc. Sure, some are bankers etc in taxis, but unlike the plumbers etc they dont NEED to be in vehicles, so they shoudl free the road for people who DO need to be. I would say they are doing rather the opposite of calling a spade a spade. That appendix conveniently ignores that the de facto current road use hierarchy, in which cyclists and pedestrians are far from the top, is only "natural" in the context of many past road design choices favouring it. Schemes such as Blackfriars (which prioritises what is now a minority mode of transport at the cost of "worsening conditions for other road users") make abundantly clear that this particular hierarchy it is itself very much being artificially imposed. By their own argument the Conservatives should be opposed to TFL's plans for Blackfriars. Some (in)conveniently placed road trains sound like a good way to disrupt it. I'm not sure what you were trying to say here, were you partly para-phrasing conservative/TFL policy...? I agree with the first part, TFLs proposal will indeed make it more difficult and dangerous for people on bikes and foot (and for those in motor vehicles, but that's another story). However, I totally disagree with the second part: that TFLs proposal for Blackfriars will make it easier and faster for people in private motor cars. It will not. We should be pointing that out at every opportunity. If the Conservatives want speed, throughput, and ease of use, then that is what we should be arguing for - the Blackfriars scheme should be about just that - increasing speed and throughput (and ease of use). It's plain to see at rush hour that cycling is speedier - it's common sense that cycling can achieve higher throughput rates than private motor car flow. For the private individual, cycling and walking solve the speed and throughput problem: obviously for those directly involved in cycling and walking, but also for those who still choose the private motor car. Extra lanes for motor traffic reduce speed and throughput, because, you know, we're not talking M25 here, this is, after all, central London, so where do they think all those extra vehicles will end up? We should be reminding politicos of this at every possible opportunity - and not (ever) repeating their mantra of speed and ease of use for the private motor car - it's just false, and doesn't need propogating. Cyclists in the City: Yes, but I would go further and say that even when you confine your area of analysis to just Blackfriars, there would be no gain in speed or throughput by introducing another lane of motor traffic. TFLs models are flawed - they are optimised for 'speed' based on two main modes of transport: private motor vehicles (inc taxis), and buses. They're not optimised for overall throughput, and therefore, not optimised for economic benefit. The Conservatives have missed a trick here; they've chosen instead to make Blackfriars a party political issue - which it plainly isn't - it's an econimic one. erm ... as a group on the Assembly the Conservatives have not declared whether or not we are for or against the 20mph limit, we don't think there's enough data at the moment. We've stated that we think the original plan for Blackfriars was flawed. It is true that we are, by instinct, anti-hierarchical and I agree with you that we should be making decisions to accommodate people's choices not what we think their choices should be. Incidentally, it's not about speed of traffic,rather more to do with the smoothing traffic flow. also, one should not need data to understand that both the original design and the slightly altered new version are both dangerous to cyclists, irrespective of the speed limit. 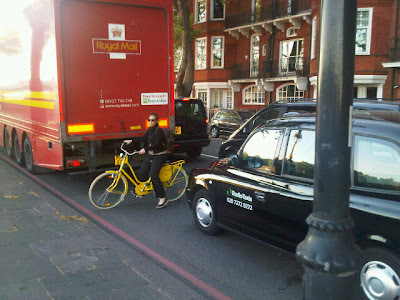 if it's not clear, one just has to attempt to filter across two lanes of fast-moving traffic, on a barclays bike.. Didn't I read somewhere that tfl use models that count cycles as only 20% of a car in their models? So, if the conservatives think that all road users should have equal treatment ( it is a right wing mantra that no one should have special treatment) then TfL should be made to change their models accordingly. "It is true that we are, by instinct, anti-hierarchical and I agree with you that we should be making decisions to accommodate people's choices not what we think their choices should be." Do you mean the choices people are making now, or the choices they might make if those in charge would step up to the mark and take the brave & admittedly sometimes difficult decisions that can make London a better city to live in, sometimes against the grain of populist opinion? There's overwhelming evidence that a lot of people would like to have the choice to cycle more (probably at least as many people as currently commute by bike) but feel unable to do so because of the (perceived or actual) danger. Double cycling's modal share through improved safety, and there's probably another whole layer of people waiting in the wings, who don't see cycling as even a /potential/ choice right now. Once a few people in your workplace start biking in, it seems much more of a normal thing to do. Finally - taking a morally neutral stand on peoples' choices is, to my mind, flawed given that some choices impose far greater /negative externalities/ (noise & air pollution, danger, perhaps CO2 also) on other users of the street space than others. Which is why it is right and proper to encourage people to walk or cycle rather than drive, and privilege multiple-occupancy and goods vehicles above private cars. Some choices are more selfish than others, and you shouldn't be afraid to take a stand on that! Boff: "we should be making decisions to accommodate people's choices not what we think their choices should be." Odd that Mr Boff opposed plans to increase flights at City Airport from 80,000 to 120,000 then. What happened to accommodating people's choices to fly, eh? Why is it that negative externalities like noise and air pollution become a concern for Mr Boff when it comes to aircraft, but danger to vulnerable road users from motor vehicles travelling at inappropriate speeds is ok? And this stuff about their "not being enough data" on a 20mph limit is clap-trap. There is plenty of evidence from TRL and others that slower traffic is safer in urban areas. What kind of data are you waiting for, Mr Boff? Another dead cyclist?? Good to see Andrew joining the debate. There is a lot to be said for being anti-hierarchical. The current hierarchy is dictated by traffic modelling techniques developed for improving flows on American style freeways; ie. in a no pedestrian, no cyclist, few bus environment. access probably means slowing some other people down, I welcome this. If the current TfL modelling give five times more weight to motor cars than cyclists it is because they guess a car creates five times more congestion than a cycle. A rational non hierarchical system would give equal weight to all people, or perhaps more weight to those people using the most space efficient modes. The previous administration at City Hall saw through the modellers conceit and told them to give more road space to buses, greatly increasing the people capacity of the whole network. We hope that with a cycling Mayor, recognizing the capacity potential of cycling on many of the bridges, will call the modellers bluff, tell them to scrap their car centred hierarchy and 'catch up with cycling'. The thing about cyclists being equal to 0.2 of a passenger car unit (PCU) mainly relates to how many vehicles can physically fit on the roads i.e. put two lanes in instead of one and you double the number of units that can queue between lights, buses are sized as 2 PCUs, articulated buses as 3.2 PCUs, etc. The big problem as I see it is that the modelling that TfL does, or others do on their behalf, assumes that all those PCUs are acting as cars i.e. that they can move at the same speed as cars and that they can change lanes, turn, etc as cars do. None of their modelling takes into the account the relatively slower speeds that cyclists travel at, nor their vulnerability in the face of other larger and faster road users. The principle software package which TfL use to micro-simulate road user behaviour at junctions, VISSIM, can only model the delaying effect that cyclists have on motorised road users, with any effects of motorised road user behaviour on cyclists discounted as unreliable and therefore ignored. If you and the other Conservative AMs really wanted a non-hierachical road system then you should be browbeating TfL to change their out-dated procedures so that all road users including cyclists are equally modelled and therefore equally considered. Call me cynical but I'm not going to hold my breath waiting to for that to happen. Certainly your comments to the above report suggest that you don't understand or even perceive that there might be a problem. assuming a lane through a junction can manage, say, 6PCUs a minute, and assuming each car has 1.5 occupants. turning a motor lane into a cycle only lane will, in terms of people through the junction, move from. to 6 / 0.2 = 30 people per minute. a full bus lane might deliver 90 people per minute. clearly, if we start to think in terms of people per minute, the most efficient way to design a junction is one wide lane for cycles, one for buses, and only then one for cars? Cycling and walking might make you more healthy too so you can shorten NHS waiting lists. Enough is enough. We argue about traffic models, throughput, speed. But it's all rubbish at the end of the day. HIS SHOES WERE KNOCKED OFF!!! I think a slightly better way to have put would have been: HIS SHOES WERE 'RIPPED' OFF. Where's this little fella's equality - where does he fit into the hierachy: toe-to-toe with SUV mother? What kind of society, and in turn, what kind of ruling gevermment lets this happen to a 6 year old? My thoughts are with the family and the emergency services. Next year (and next week, and next month) we'll be arguing about the same stuff: modelling, speed, throughput, cameras, traffic calming etc. Unfortunately, and in the the interim, many more children will be on the fatality list - all in the name of congestion creation. So, I ask this: What kind of people do nothing in the wake of this kind of murder? here's an easy way to reduce traffic (and the space it needs) . place black cab request buttons on street corners (with a camera, so malicious users can be identified). keep cabs in a queue with the engine off, nearby, off the road. stop all that cruising around empty.